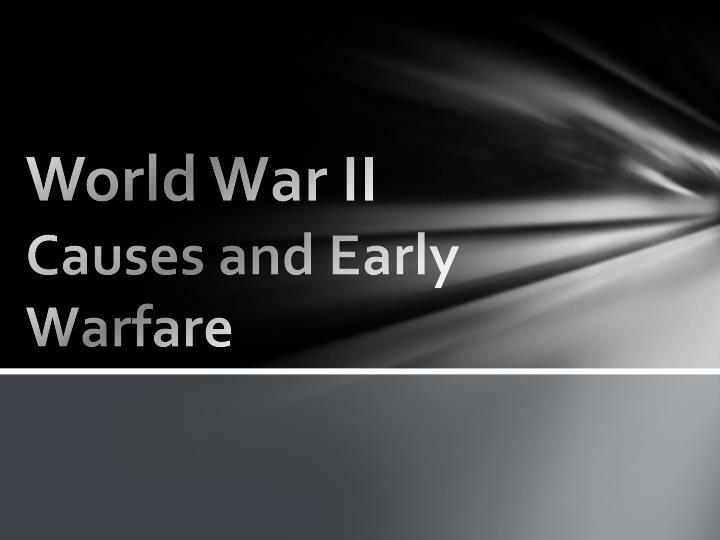 World War II Causes and Early Warfare. 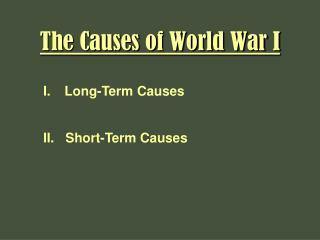 Causes. 1. 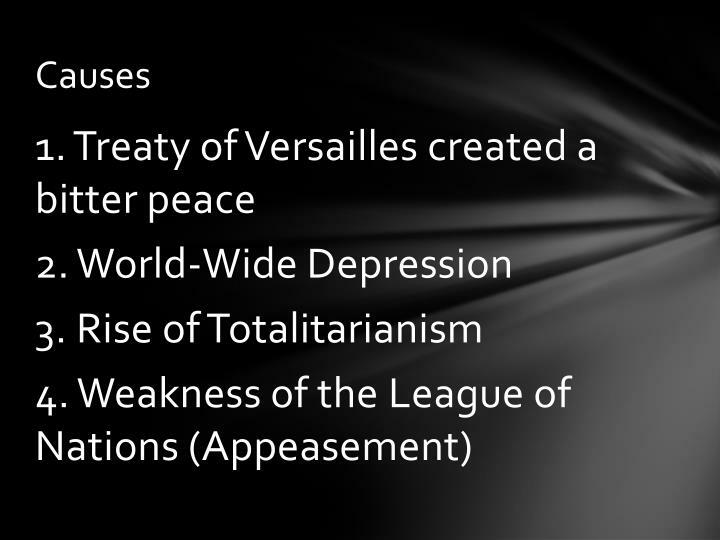 Treaty of Versailles created a bitter peace 2. World-Wide Depression 3. 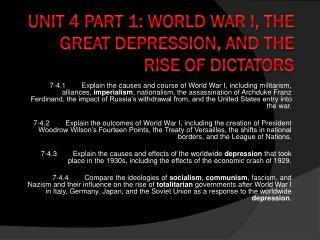 Rise of Totalitarianism 4. 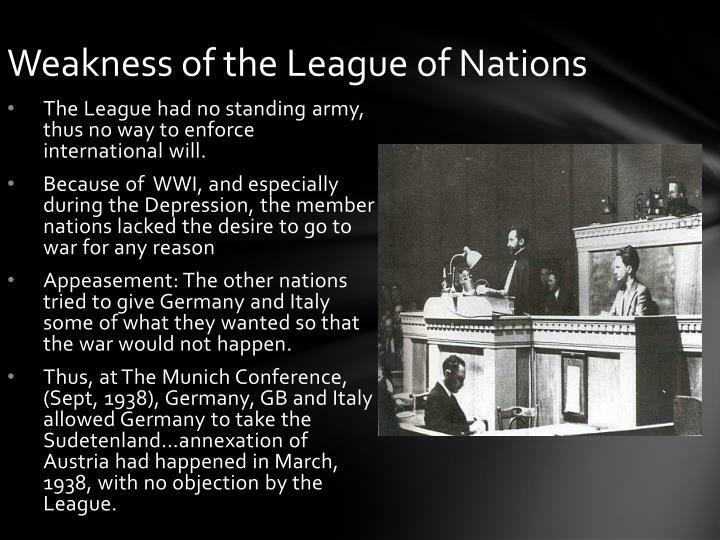 Weakness of the League of Nations (Appeasement). 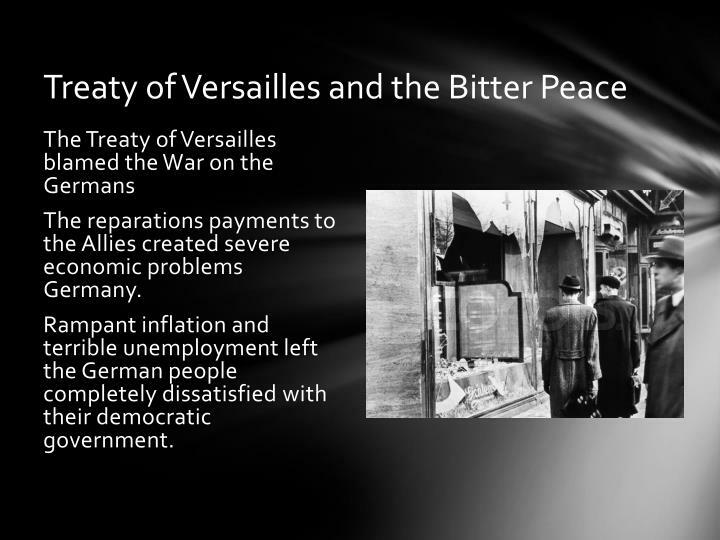 Treaty of Versailles and the Bitter Peace. 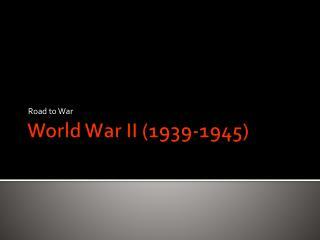 The reparations payments to the Allies created severe economic problems Germany. Rampant inflation and terrible unemployment left the German people completely dissatisfied with their democratic government. 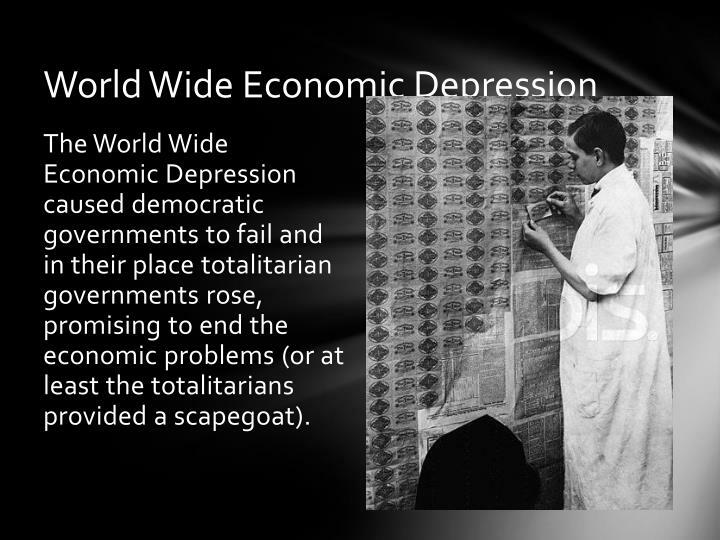 The World Wide Economic Depression caused democratic governments to fail and in their place totalitarian governments rose, promising to end the economic problems (or at least the totalitarians provided a scapegoat). 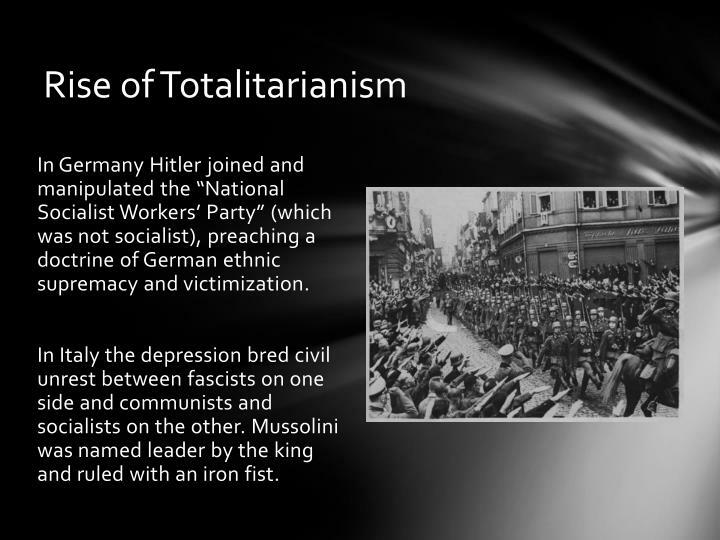 In Germany Hitler joined and manipulated the “National Socialist Workers’ Party” (which was not socialist), preaching a doctrine of German ethnic supremacy and victimization. 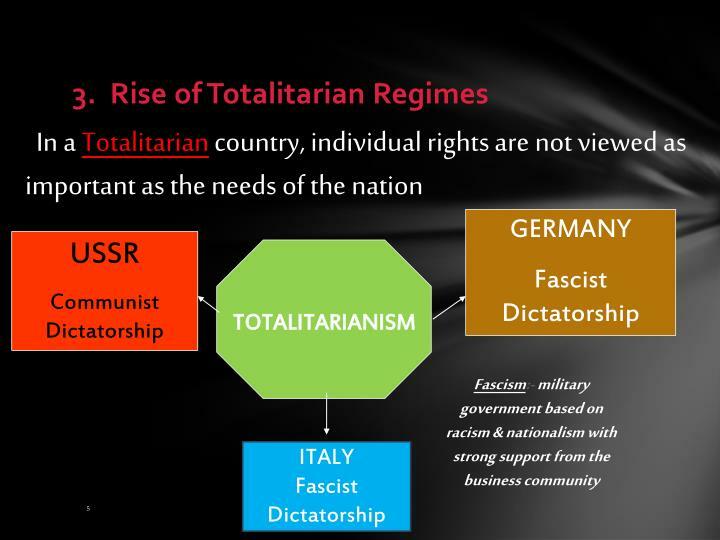 In Italy the depression bred civil unrest between fascists on one side and communists and socialists on the other. 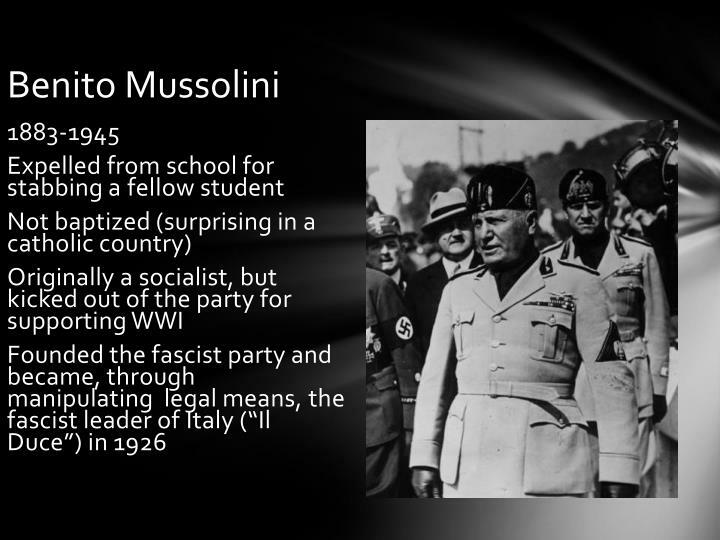 Mussolini was named leader by the king and ruled with an iron fist. 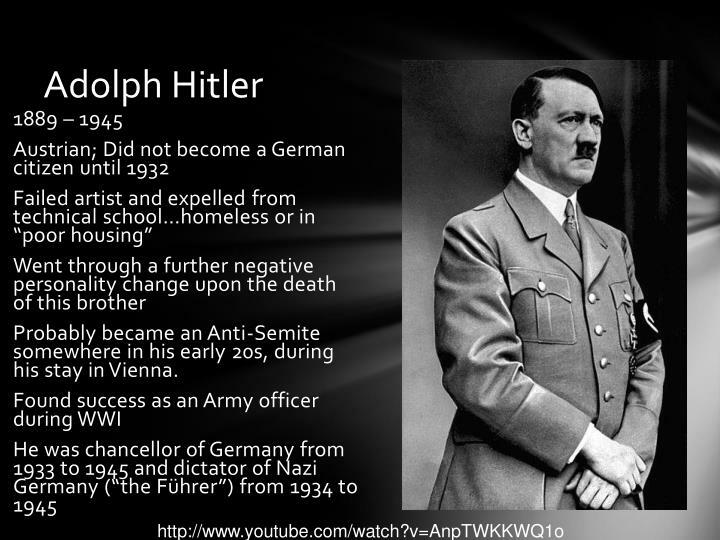 Probably became an Anti-Semite somewhere in his early 20s, during his stay in Vienna. 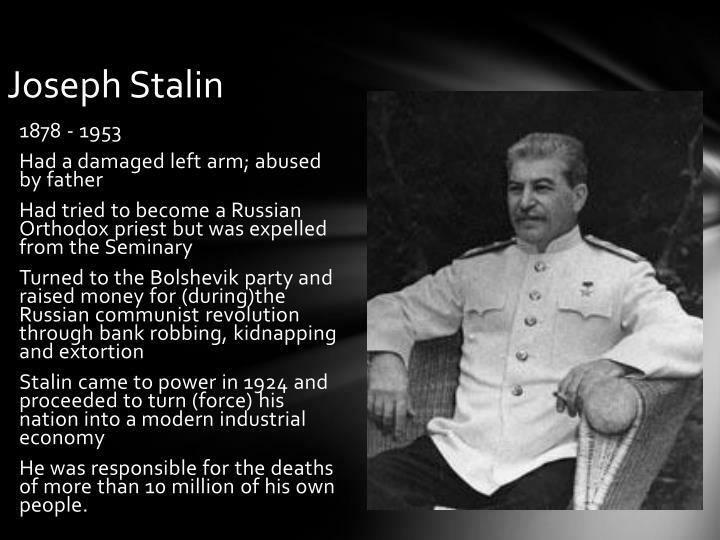 He was responsible for the deaths of more than 10 million of his own people. So what did Hitler want? To rebuild his army, navy, and airforce. The return of all German-speaking lands (Anschluss) : Austria, The Sudentenland (Western Czechoslovakia). 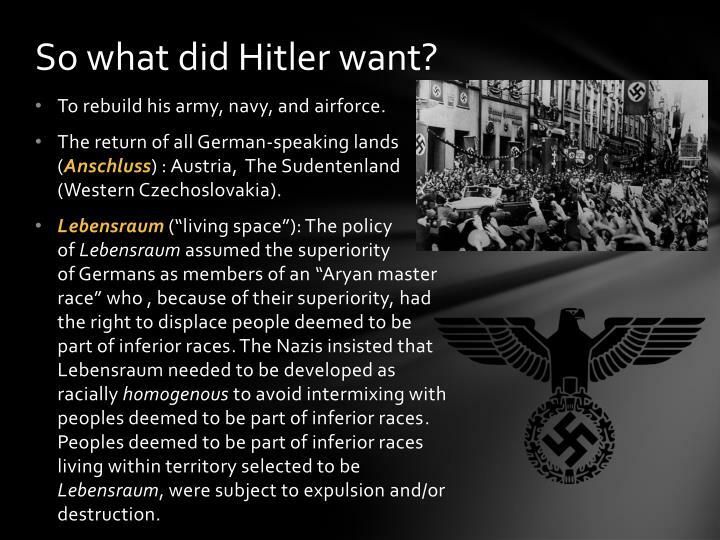 Lebensraum (“living space”): The policy of Lebensraumassumed the superiority of Germans as members of an “Aryan master race” who , because of their superiority, had the right to displace people deemed to be part of inferior races. The Nazis insisted that Lebensraum needed to be developed as racially homogenous to avoid intermixing with peoples deemed to be part of inferior races. Peoples deemed to be part of inferior races living within territory selected to be Lebensraum, were subject to expulsion and/or destruction. The League had no standing army, thus no way to enforce international will. 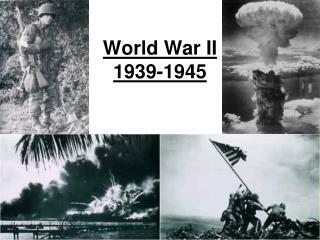 Appeasement: The other nations tried to give Germany and Italy some of what they wanted so that the war would not happen. Thus, at The Munich Conference, (Sept, 1938), Germany, GB and Italy allowed Germany to take the Sudetenland…annexation of Austria had happened in March, 1938, with no objection by the League. 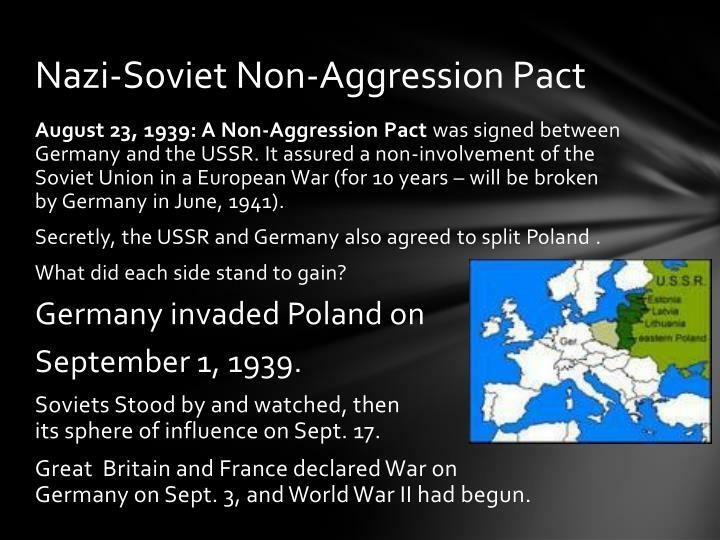 August 23, 1939: A Non-Aggression Pactwas signed between Germany and the USSR. 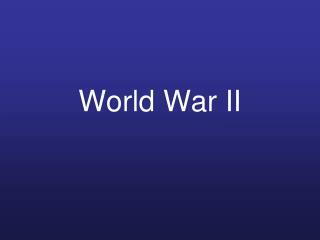 It assured a non-involvement of the Soviet Union in a European War (for 10 years – will be broken by Germany in June, 1941). 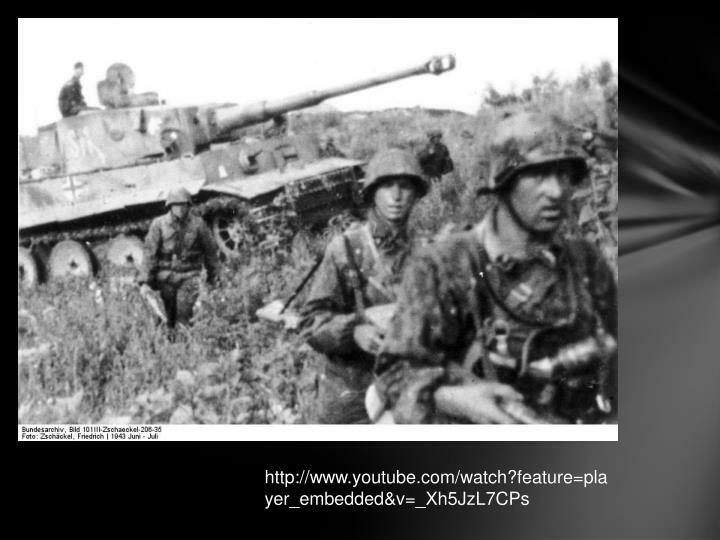 Secretly, the USSR and Germany also agreed to split Poland . What did each side stand to gain? 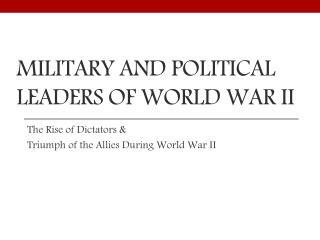 Soviets Stood by and watched, then moved into its sphere of influence on Sept. 17. 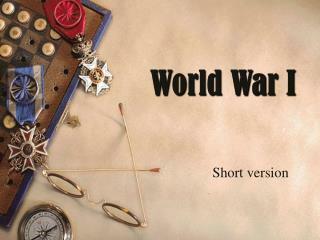 Great Britain and France declared War on Germany on Sept. 3, and World War II had begun. 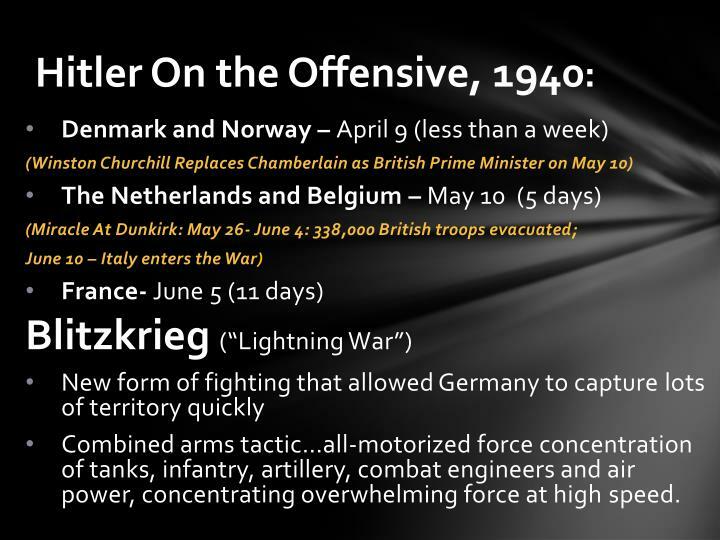 Combined arms tactic…all-motorized force concentration of tanks, infantry, artillery, combat engineers and air power, concentrating overwhelming force at high speed. 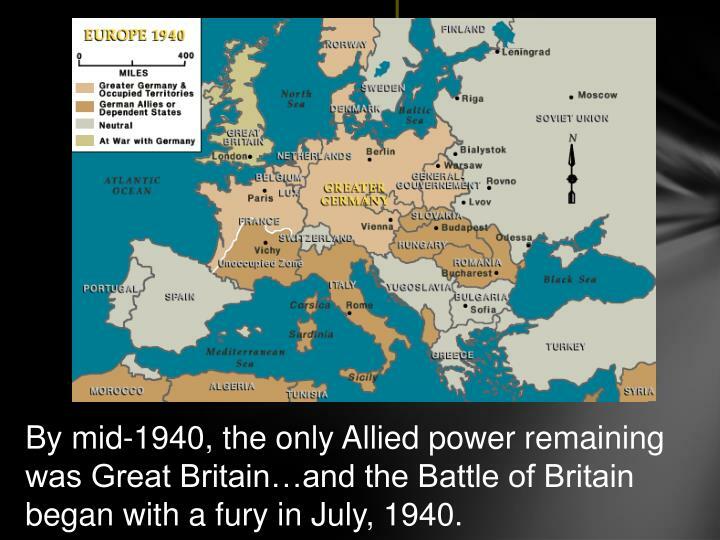 By mid-1940, the only Allied power remaining was Great Britain…and the Battle of Britain began with a fury in July, 1940. 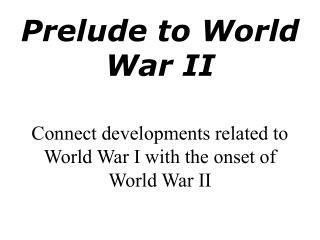 We did not want to get in other countries’ conflicts – The experiences of World War I had taught us to avoid war, and the Great Depression had turned our attention to domestic matters. 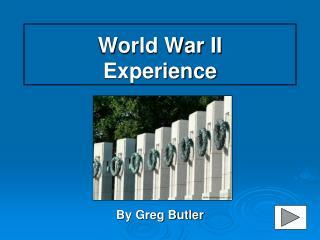 Question: Why did we really go to war during WWI? 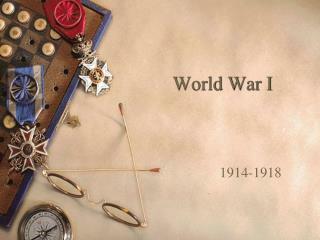 War is a contagion, whether it be declared or undeclared. It can engulf states and peoples remote from the original scene of hostilities .... We are adopting such measures as will minimize our risk of involvement, but we cannot have complete protection in a world of disorder in which confidence and security have broken down. 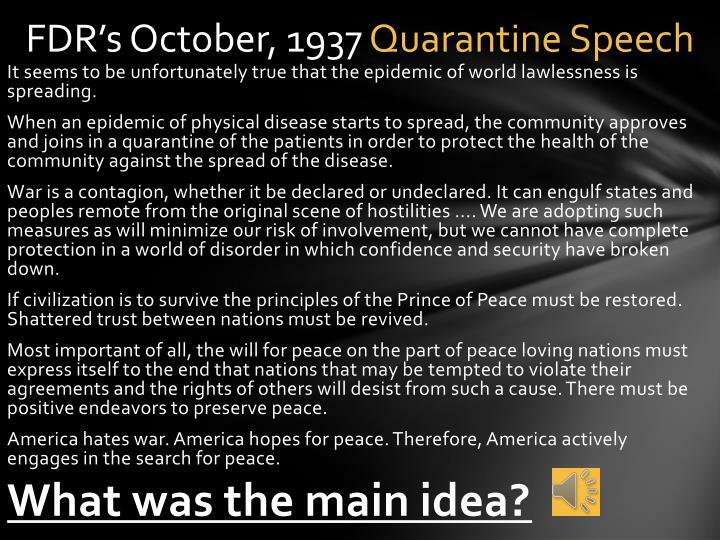 If civilization is to survive the principles of the Prince of Peace must be restored. Shattered trust between nations must be revived. Most important of all, the will for peace on the part of peace loving nations must express itself to the end that nations that may be tempted to violate their agreements and the rights of others will desist from such a cause. There must be positive endeavors to preserve peace. 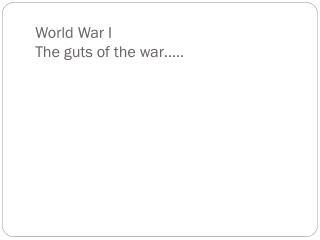 By late 1940, the debate between isolationists and interventionists was raging. 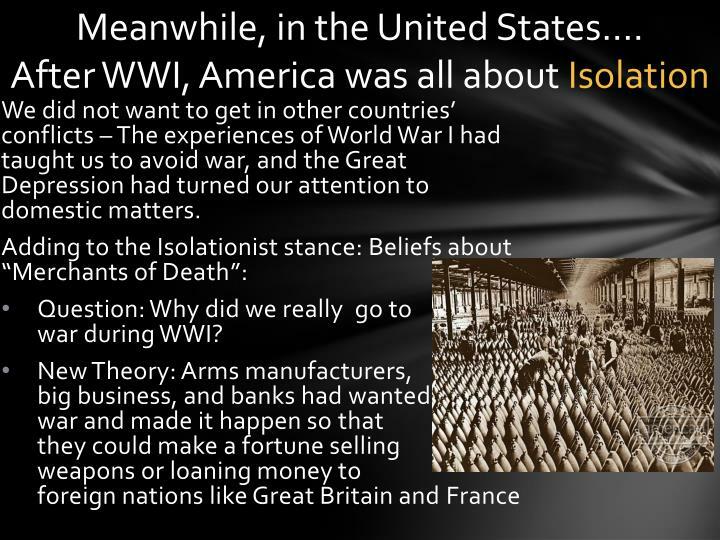 When France fell to Germany, leaving the British on their own against the Axis powers, many Americans were worried about staying (isolationist) neutral. After Germany, Italy, and Japan signed the Tripartite Pact in September, 1940, America had even more reason to worry. 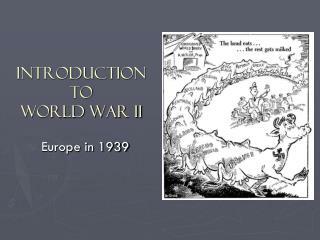 Congress passed a Civil Service Act (9/1940)– a peacetime draft of 1.2 million active soldiers (& 800,000 reserves) a year. 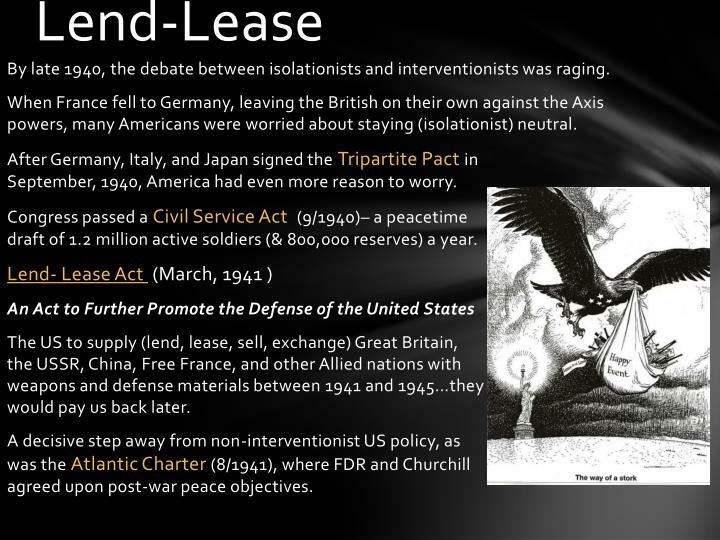 The US to supply (lend, lease, sell, exchange) Great Britain, the USSR, China, Free France, and other Allied nations with weapons and defense materials between 1941 and 1945…they would pay us back later. 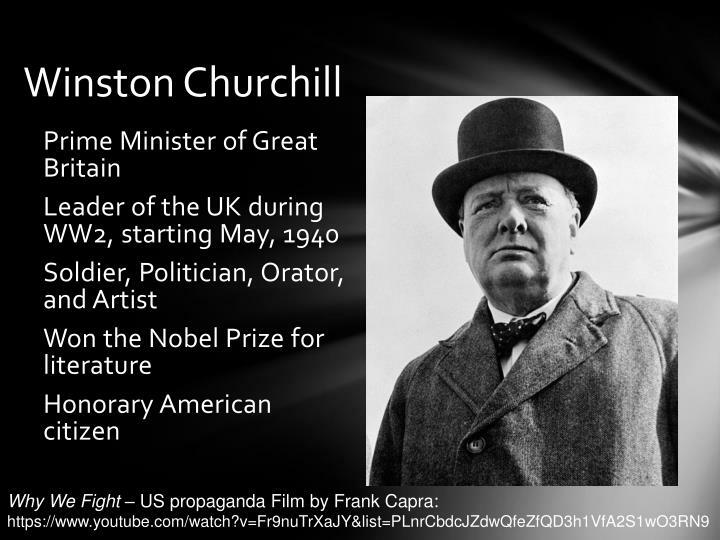 A decisive step away from non-interventionist US policy, as was the Atlantic Charter (8/1941), where FDR and Churchill agreed upon post-war peace objectives. So what was up with Japan? 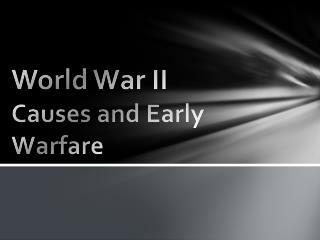 Tensions had been heating up between the Japanese and the Americans in the Pacific region in the decades since WWI. 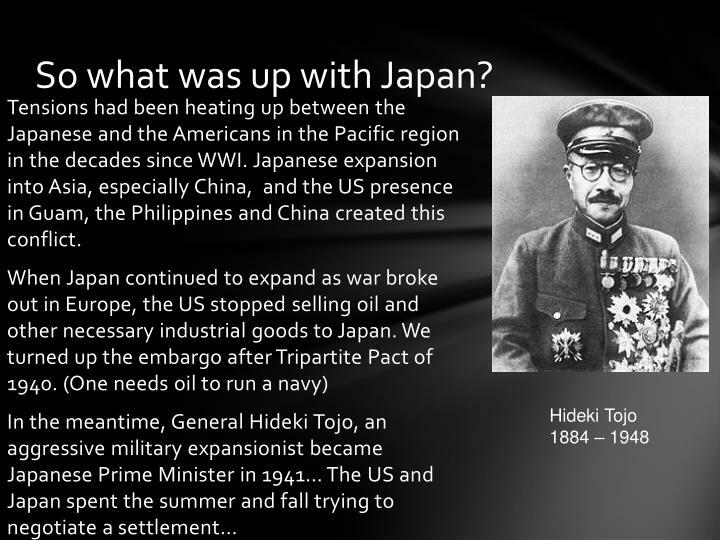 Japanese expansion into Asia, especially China, and the US presence in Guam, the Philippines and China created this conflict. Luckily, US aircraft carriers (and 7 destroyers) were out at sea on maneuvers, and the American Fleet and submarine bases, and fuel facilities survived the attack. 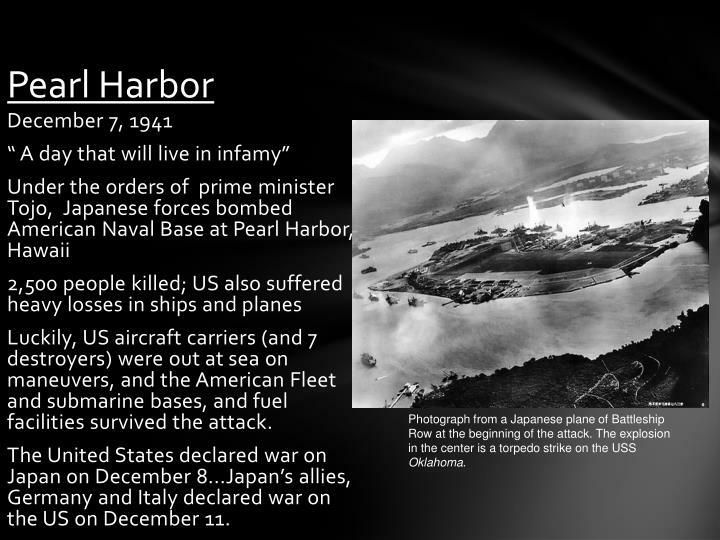 The United States declared war on Japan on December 8...Japan’s allies, Germany and Italy declared war on the US on December 11. Photograph from a Japanese plane of Battleship Row at the beginning of the attack. 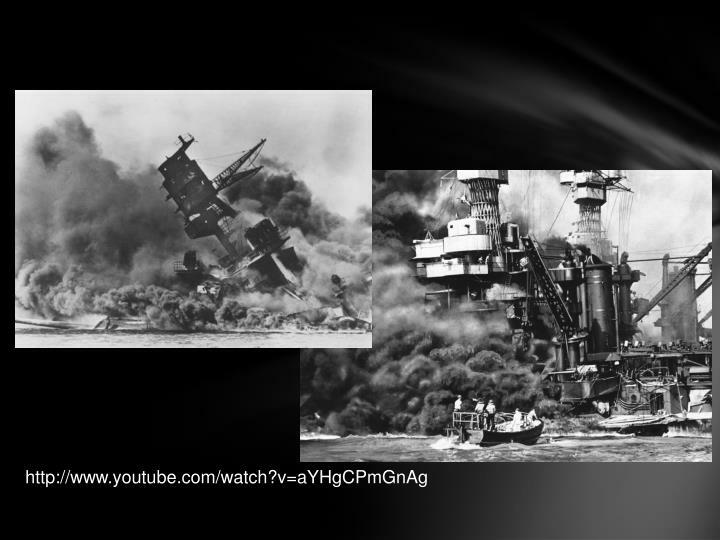 The explosion in the center is a torpedo strike on the USS Oklahoma. 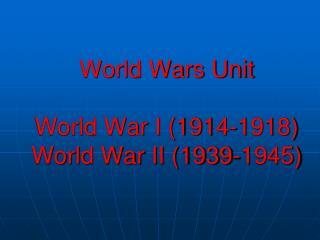 World War II 1939-1945 -. 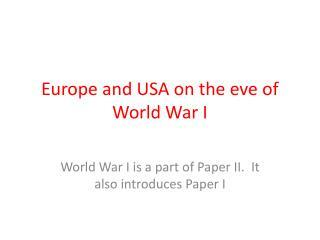 i. after world war i: world war i laid the foundation for world war ii. 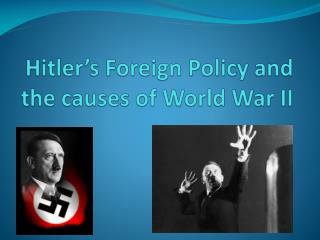 many events set the stage for a dictator or dictators to rise and war to start. desire to stay out of world affairs. ex. 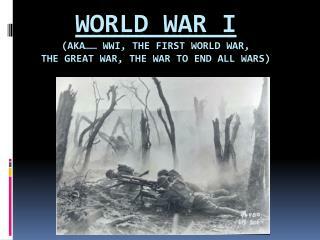 World War 1 (1914-1919) “The Great War” “War in the Trenches” “The War to End All Wars!” -. 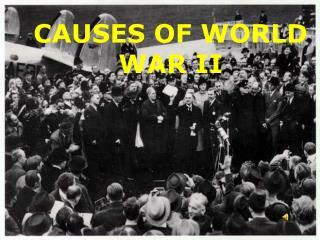 indirect reasons for war. 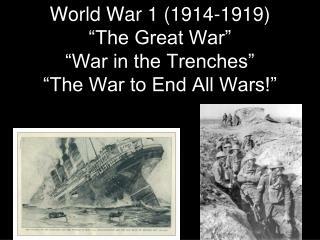 3 main reasons for war! 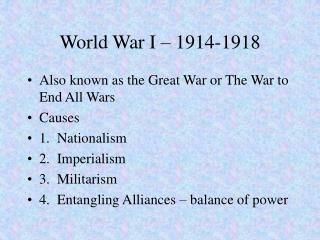 1. imperialism 2. nationalism 3. militarism. 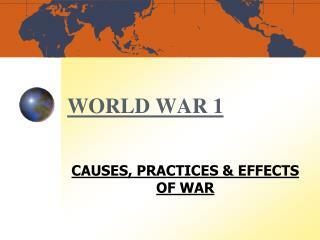 World War I The guts of the war….. -World war i the guts of the war….. . causes of world war i. balkan powder keg caution explosive. 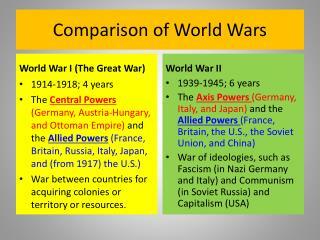 m ilitarism arms race. blank check given to austria by germany. a lliance system. n ationalism.